DEWALT 12-in 15-Amp Dual Bevel Sliding Compound Miter Saw - DWS779 Brand New! Brand New in Factory Packaging w/Warranty! DEWALT DWS709 12" Sliding Compound Miter Saw with stand! 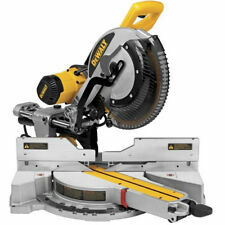 19 product ratings - DEWALT DWS709 12" Sliding Compound Miter Saw with stand!